Fried chicken takeaway on South End. Note: As of February 2019 there's a sign up photo stating that it's closed for renovation but will be open again soon under new management. 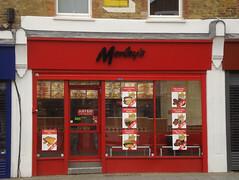 They also do delivery, and offer online ordering via Just-Eat. According to a photo on Flickr, as of 1970 the premises were occupied by a business called something along the lines of Bunny or Bunnies (most easily visible at original size). Last edited 2019-02-07 14:50:34 (version 26; diff). List all versions. Page last edited 2019-02-07 14:50:34 (version 26).